Saturn to enter Capricorn on December 19, 2017 — slow down! Serious business ahead! Saturn moves through one sign in about two and a half years. This will be its first transit through Capricorn since 1988-1990. If you recall, those are the years that surrounded the fall of the Berlin wall, on November 9, 1989. One of the keywords for Saturn is “wall.” Plus, that wall was up for 30 years, one Saturn cycle! Back then, not only Saturn, but electric Uranus and oceanic Neptune were also transiting through Capricorn, moving in and out of conjunction during part of that time, and not leaving until 1995. The millennial generation, born during those years, is tasked, on an unconscious level, with dissolving (Neptune), breaking down (Uranus) and reconfiguring (Saturn) forms — of both our own bodies and the institutions of society. For Capricorn is a sign that rules form, structure, rules, roles, regulations. It sets the philosophies and ideologies of Sagittarius (where Saturn transits just prior to Capricorn) in place, gathering, holding, and stabilizing energetic flows through its forms and channels. This time around, since early 2015 during which Saturn has been moving through Sagittarius, has triggered intense debate on what kinds of ideas and ideals we should use to reform or transform society. The debate has been heated (Sagittarius is a fiery, sometimes preachy sign) and often dogmatic (Sagittarius, when unevolved, resorts to dogma, the illusion of certainty). How DO we maintain our own individuality and autonomy while also connecting on a deep level with what is best for the whole? How do we appreciate both, simultaneously? 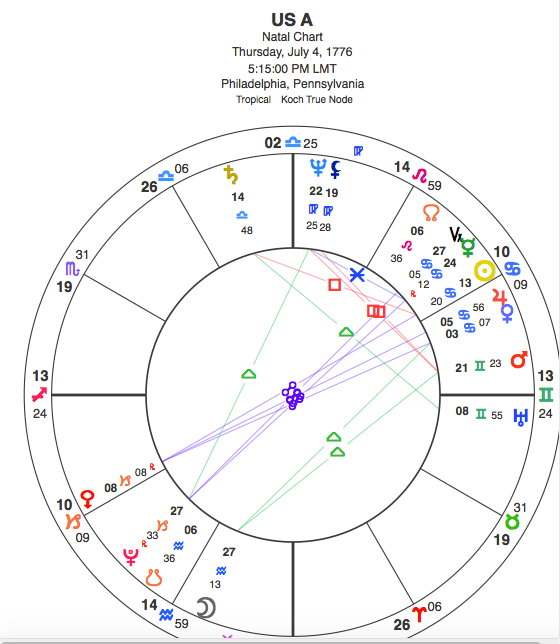 The dynamic between them, with one ever seeking (and failing) to crush the other, is ongoing, and will ultimately erode whatever remains of current structures of civilization during the years when transit Pluto moves back and forth across natal Pluto in the U.S. chart. Natal U.S. Pluto sits at 26°33 Capricorn. Transit Pluto is now only eight degrees away, moving through at 18° Capricorn. Even now, transit Pluto begins to foreshadow the enormous transformational changes required when a planet makes its first return to its natal place since that entity’s birth. For yes, this is the very first time in its short history that the U.S. will be fully absorbing the long-cycled observance of Pluto, the first time that this young, adolescent nation will have to begin to recognize the right use and misuse of power. Compared to other, older nations, the U.S. nation, with its imperious imperial reach, has been acting like a two-year-old, yelling “me me me!” over and over again, selfish, myopic, and driven by tantrums. We can feel the changes. They are epic. Already no longer is the U.S. Empire getting its hegemonic way across the globe. And it hurts. Meanwhile, here comes Saturn, about to enter that same sign of Capricorn, and in Saturn’s case, Capricorn is the sign it actually rules. In other words, the meaning of planet Saturn (teaching lessons from hard experience) and the meaning of the sign (rules, roles, regulations, form, structure) agree with each other. That makes this coming transit stronger than usual. We will be forced to pragmatically rebuild structures through hard lessons about what works and what does not. Not just our visions and ideals count. The breezy Sagittarian insistance on its beliefs as best gets grounded into material reality with Capricorn — or not! Saturn itself, entering 0° Capricorn only two days before Winter Solstice 2017, when the Sun reaches 0° Capricorn, and joining the sun in being only three degrees from the 27° Galactic Center during this deep winter turning time, lends a definite Capricorn aura to this particular Winter Solstice. Serious business lies ahead folks, and we can’t escape it. We will be forced to slow down. To pay attention to practical matters. To focus and plan ahead while knowing that all plans are liable to crumble in the light of what’s coming next. And it’s better to tune into the coming unpleasantness (for that IS how we think of actually working with the physical world rather than just thinking about it), rather than just trying to ignore it. In any case, avoidance will be short-lived. We will be forced, slammed, into paying attention to actual material reality. Transit Saturn will move through Capricorn starting December 19, 2017, and reach the natal U.S. Pluto during the years 2019-2020. Transit Pluto will reach the natal U.S. Pluto from those same years throughout the first half of the 2020s, until 2025. If we think we’ve seen big changes so far, think again. And get ready to surf massive material reconfigurations on Planet Earth. And we haven’t even mentioned Uranus, due to leave fiery Aries for earthy Taurus in May 2018, where it will remain until the end of 2025. Two earth signs, Capricorn and Taurus, are about to be occupied by two long-range outer planets, Pluto (now buttressed by Saturn) and Uranus, signalling a massive unconscious shift, not only in the cultural atmosphere but in our hearts and souls. We have been living in our minds, going faster and faster, obsessed with virtuality and triviality. In doing so, we have been either treating our living bodies, and our living mother earth as A.I. machines, or ignoring them outright — for far too long. Thus this shift comes as a needed correction. Plus, notice: natal U.S. Pluto at 27°33 Capricorn sits in a close opposition to natal U.S. Mercury at 24°12 Cancer. We are already feeling the effects of transit Pluto nearing this opposition, with the obliteration of mass mind control (Pluto) as promulgated by the MSM media (Mercury). I was born with Saturn at 14 degrees Cap– Had both sons during my first return, now getting ready for return #2–hang on!